Weather, scheduling conflicts and other issues have kept me off the traditional Zodiac lobster attack machine, and I have given up on serious lobster hunting from shore dives. 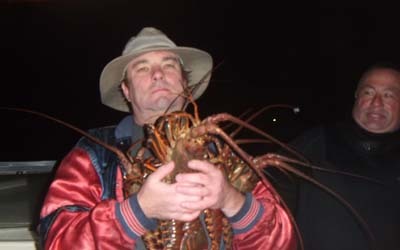 When I was invited on Chipper’s boat to liberate lobsters in a new, and still secret, location, I could not refuse. We met at the public launch ramp in the middle of a Los Angeles ghetto. Immediately when I arrived, bum and poaching drama was already underway. Some drunken bums had gotten into a fight and one was lying on the ground, unconscious, while his friends were yelling at him not to get up. We launched the boat with little drama, and after a quick emergency dart back to the ramp to put the drain plug in, we were off. I was the first one off the boat – we were to dive in shifts, always leaving someone on the boat – this is the ghetto, and not even boats are safe. I descended and checked the anchor – the anchor was just dragging on the sand – I believe the anchor chain was too short. Initial visibility sucked – I mean sucked so badly I was going to call the dive in the first five minutes. Then, I ran across a bed of muscles and a short lobster – OK, there’s lobster! I kept going, and within the next ten minutes, I had caught six bugs – and, these were the easiest bugs to catch, too. They didn’t act spooked like the one off of Palos Verdes; I simply shined my light on them and they froze until I grabbed them. A lobster’s life is so horrid, they can’t wait to get liberated. I spent the next 25 minutes looking for my seventh to limit – easy, right? Nope – seriously, I thought I would have had my limit within 10 minutes, but either I took the last six legal bugs, or word had gotten out, and those that wanted to live stayed home. I made it back to the boat with no issues – Reverend Al had gotten skunked on his first dive, so he went back for a second one. Chipper then made his dive; I stayed on the boat. As self punishment for not limiting, I decided not to do a second dive for just one lobster. I had to move the boat away from the rocks a couple of times – the anchor wasn’t holding it. Reverend Al made it back and we ended up picking Chipper up when he surfaced about half a mile away. I hold my catch for the night, while Chipper looks on in amazement. The Reverend and Chipper both went home with one lobster each. The highlight of my night was going to be to get hassled by that hot DFG Officer that looks like Danica Patrick, but two male officers obliged in her place. Disrespectful hunters left lobster carapaces rotting on the pavement – it was dark, so my photo didn’t come out, but there was a garbage can five feet away from this. 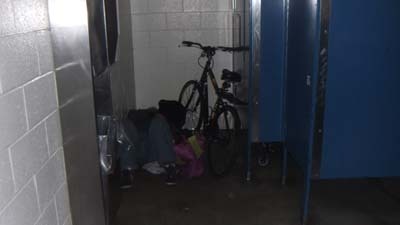 How can someone sleep on a concrete floor, covered in urine, in a room that smells like a sewer? Needless to say, this was an interesting night. Had a great time in spite of the minor and multiple drama. Thanks for the sweet hook up. Sorry DFG Danica didn’t get to through the “penal code” at you. She was probably just too intimidated. Thank you for a bug report, sounds fun. Factoring in ghetto and low vis I will hazard to guess you all dived a breakwall somewhere north of Redondo. 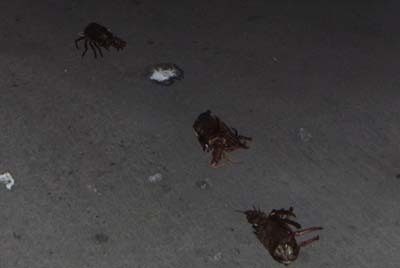 What kind of divers leave the de tailed lobster carcasses out in the street, be careful when you all dive there. NOT EVERYONE IS HOMELESS THROUGH CHOICE. I HEARD OF A GIRL WHO LEFT HOME AT 16 BECAUSE HER STEP FATHER WAS SEXUALLY ABUSING HER. BUT AS SHE HAD NO PLACE ELSE TO GO SHE SLEPT ON THE STREETS. PEOPLE ARE QUICK TO JUDGE WHEN THEY HAVEN’T BEEN IN THAT SITUATION. JUDGE NOT LEAST YE BE JUDGED YOURSELF. GIVE IT SEVERAL YEARS THAT MAY BE YOU SLEEPING IN THAT TOILET. THAT WARM. COZY TOILET. THAT URINE HOMEY SMELL WHEN YOU KNOW YOU HAVE ARRIVED AT THE BOTTOM OF 99%. RETHINK AND REPENT YOUR SINS. SEE JOHN 3:16! Most cities have shelters for abused women. Nobody is forced to drop out of school, commit crimes, become addicted to drugs/alcohol/tobacco, etc. I believe 99% of the people on the streets or living off the tax payers do so by their own choice. No amount of Bible thumping will stop people from destroying their lives. Bums are bums, no more, no less. I’ve been poor most of my life, yet I’ve somehow managed to work for what I have and not smell of urine. This guy didn’t look like he was ever a 16 year old girl to me. PSD was just making an observation that the conditions seemed less than optimum. Hey, your lobster season countdown is off– the season ends the Weds following 3/15– which makes it 3/21/12– NOT in 6 days like your header says… Gave me a scare! Crap! Thanks Tom! I fixed it! I owe you a beer! Lobsters are wonderful, it looks like one big adventure to You!